About a hundred invited guests including officials from the Solomon Islands government, SIFF, the participating clubs and members of the media attended the event which was held at the SIFF academy football pitch. The evening started with speeches coming from the SIFF President Martin Alufurai, Deputy Prime Minister Hon. Manasseh Maelanga and Chairman of the Our Telekom Board of Governors, John Beverly. The official declaration to open the Telekom S-League was made by Hon. Maelanga and his statement was followed by cheers and claps from the invited guests. The highlight of the evening was the unveiling of the Telekom S-League logo by the 3 speakers for the evening who were joined by FIFA development officer for the Oceania Football Confederation (OFC), Glenn Turner. 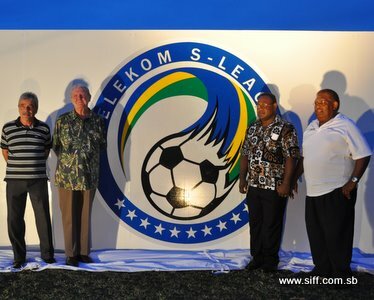 The public launching was held at Lawson Tama today with the friendly match between a combined Bilikiki and Kurukuru team against the Solomon Islands national U-20 training squad which provided a preview of the Telekom S-League itself since most of the players taking the field have been signed up by the 8 franchise clubs. Forty-four lucky spectators walked away with promotional Telekom S-League merchandise which were thrown into the crowd prior to the start of the match by players from both teams to promote the competition. The match was followed by live performances from a number of local bands which continued entertaining the crowd until late in the evening. The first matches of the Telekom S-League will kick off next starting with the opener between Malaita Kingz and JP Su’uria at 1:00pm on Saturday.